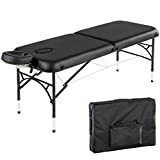 Comfort and Smooth:The massage Table is precision crafted with the sturdy woods, 2.56" thick of multilayer high-density luxury padding to ensure a more comfortable massage experience. Professional: Push-Button numbered leg adjusters for quick, easy and accurate height adjustment.Non-skid, non-mark foot pads keep the table from becoming wobbly or squeaky. Function & Dimensions: The adjustable head rest allows the client to be put in different positions. 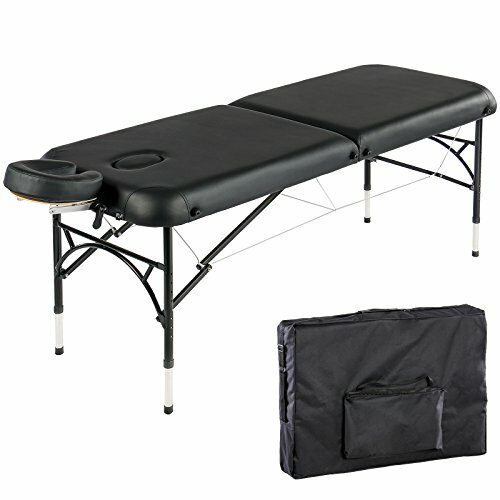 Table Dimensions: 83.86" Long (with face cradle) x 27.95"Wide, Adjustable Height: 25" to 33.27".It can be folded into a compact size and comes with a free carrying bag for easy transport and storage.